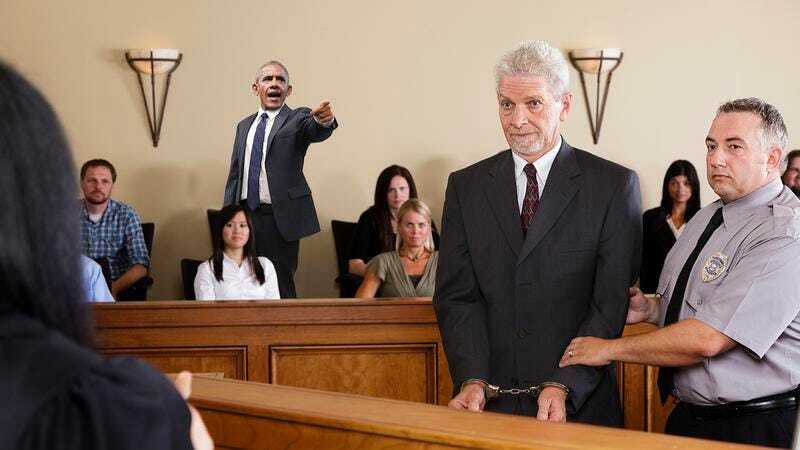 It’s been almost a year since Barack Obama left the White House, but even after spending so much time as a civilian, he’s still sticking out like a sore thumb: President Obama was just kicked off of jury duty for yelling “Crucify him!” too many times in the courtroom. There’s no way to sugarcoat this. This is completely embarrassing for the former POTUS. According to those present in the courtroom, President Obama, who received a summons for jury duty in late October, quickly become a source of disruption after he stood up numerous times during the court proceedings, pointed a finger at the defendant as he sat quietly with his attorneys, and screamed, “We must crucify him!” Witnesses say that Obama would point to the defendant and shout “Crucify him!” during all stages of the legal process, including when prosecuting attorneys were trying to speak and when the judge was trying to address the jury before the trial actually began. It looks like the former president needs to learn how to take a hint. You’ve got to think that Barack wishes he had a do-over on this one! Court transcripts show that President Obama interrupted the proceedings of the court by screaming “Crucify him!” nearly 200 times within a span of three hours before the judge ordered that he be removed from the jury. Honestly, it’s amazing that he wasn’t kicked off sooner! Yikes. This is definitely pretty embarrassing. Let’s just hope that by this point, the former POTUS regrets his behavior, and has realized that screaming “Crucify him!” in the middle of a courtroom is not behavior befitting a former President of the United States—especially one fulfilling the civic duty of serving on a jury. Next time he’s called for jury duty, President Obama should, at the very least, act with a little more decorum!